Daredevil #1, Page 2, Panel 6. 2011. My girlfriend took me on a Daredevil tour of the city last weekend—completely by accident. 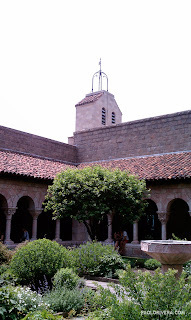 We had always wanted to see the Cloisters, so we made a day of it, but as we meandered back down Manhattan, we were unwittingly visiting the landmarks from the first 3 issues: The Cloisters, the building I based the law offices on (both from issue 1), The High Line (issue 2), and the West Side Highway intersection where he fights Klaw (issue 3). It helped that the last 3 landmarks are all near each other, but it was serendipitous, nonetheless. 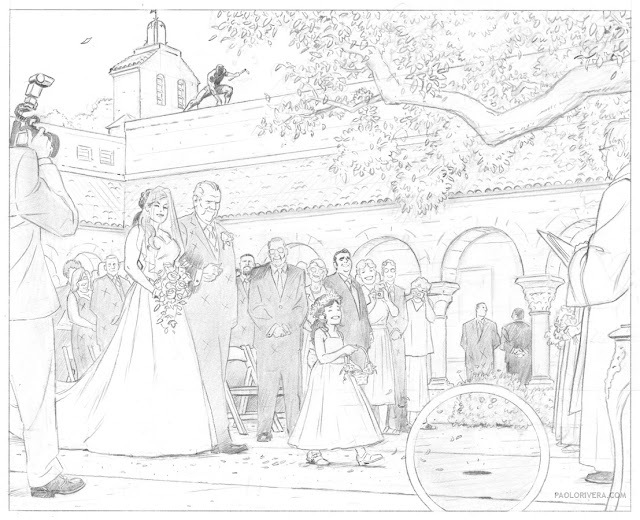 When I did the above panel, I was basing it entirely off of other people's photos (OPP!) that I found on-line, as well as a Google Maps 3D model of the place. It was nice to finally see it in person, though it was strange to know a place so well that I'd never actually visited. As you can see, I made some minor changes to the courtyard, gutting most of the garden, and putting a large tree on the right (for DD to swing around). 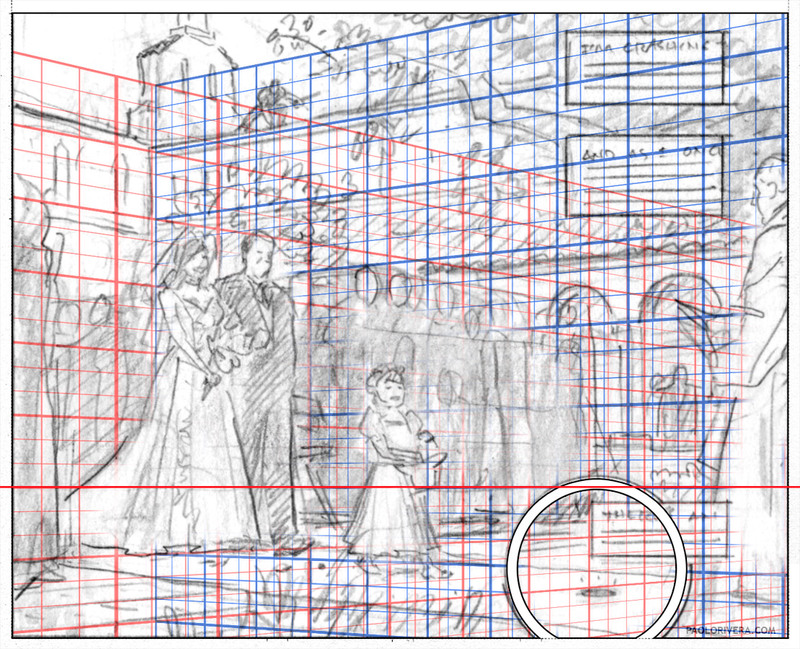 As usual, it all starts with a rough layout, upon which I overlay digital guidelines. I still need to dedicate a series of posts to my perspective template, but I'm planning to offer it as a download, hopefully via Kickstarter. I'm beefing it up so it's worth it. 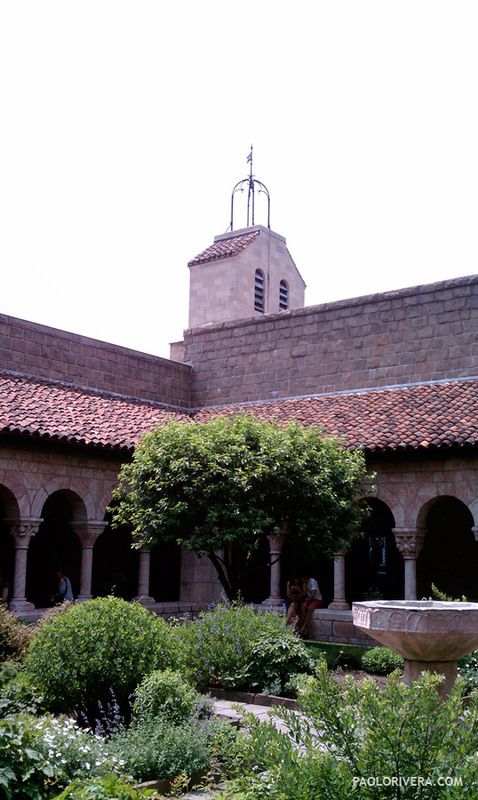 For more of the Cloisters reference that went into this sequence, check out WRW, No. 157. I still have my perspective templates from interior design school. Those were the good ol' days. 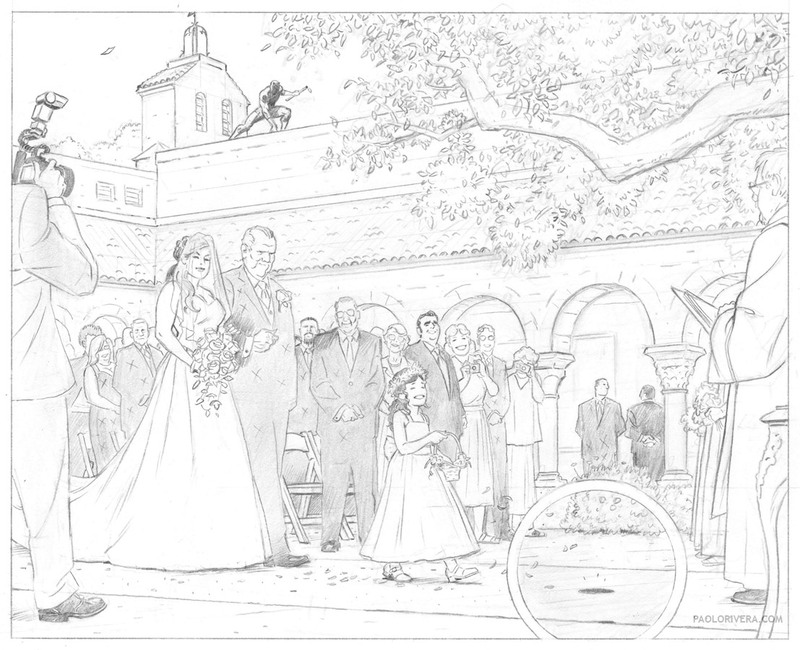 I think this is why I was first drawn to your art, because I could tell you really knew your stuff when it came to rendering the architecture in the backgrounds. Thanks for showing us the real place. Maybe I'll get to see it in person someday. It's definitely worth the trip. I had been meaning to go for about 8 years. I adore your Wacky Reference Wednesdays! They really help. P.S. Every time you say, "My girlfriend," my heart breaks a little. She's a lucky girl! Thanks. I tell her that every day. 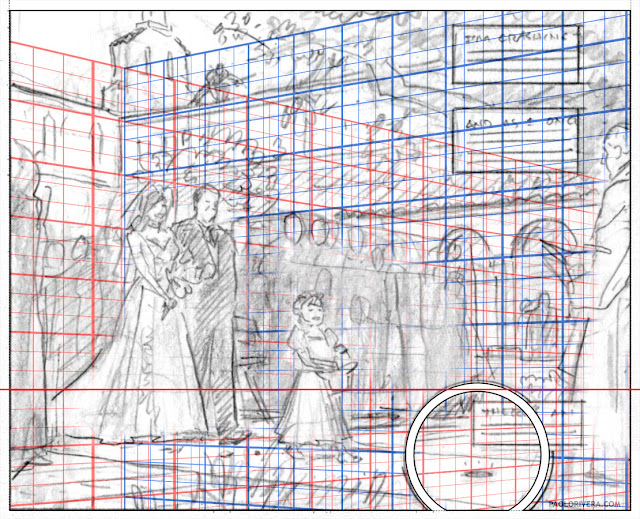 I would very much like to see a series of posts on perspective templates as its an area of my work that needs some improvement. 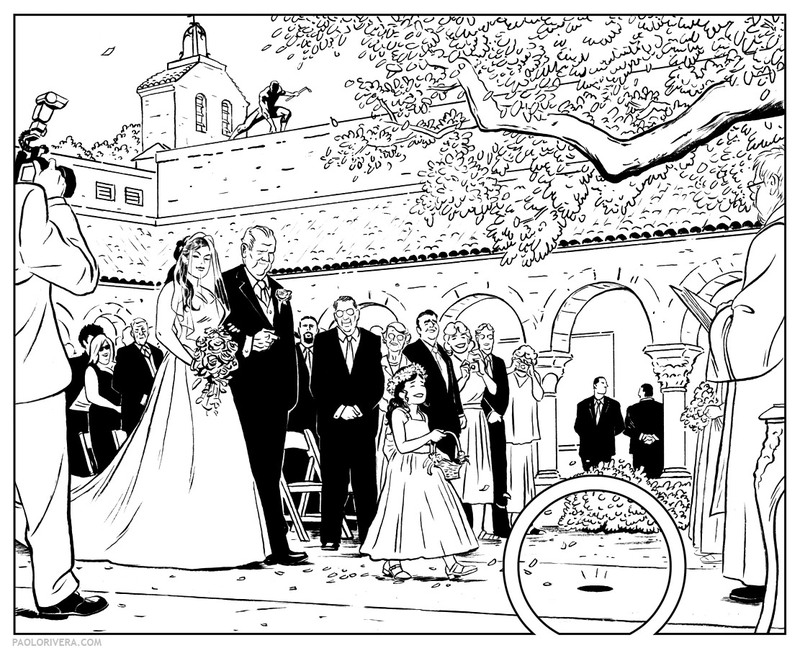 What I want to do is write a series that can be consolidated into a pdf to accompany the template. I worked on it a little bit today. Hope to release it before the end of the year.